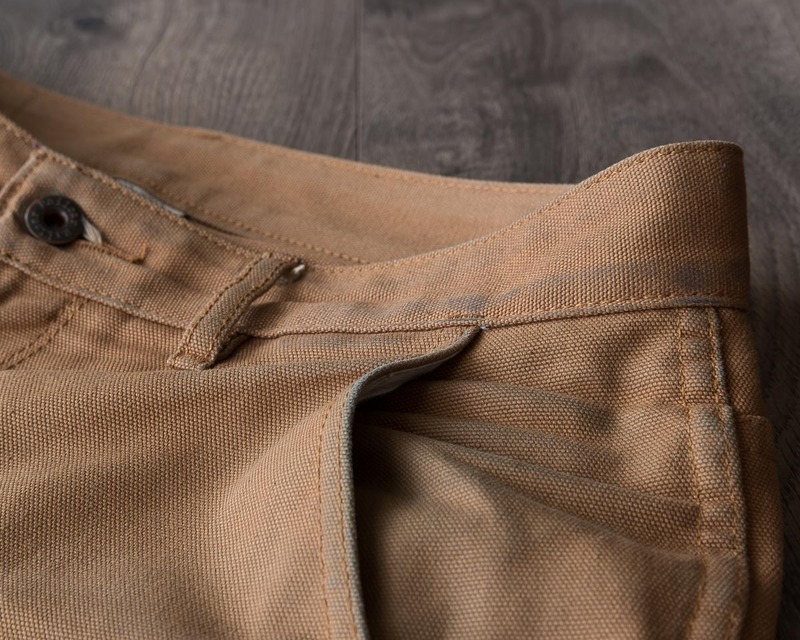 The Railcar Fine Goods Camel Flight Trouser is constructed out of a durable 12 oz duck canvas fabric with felled inseams throughout for extra strength. 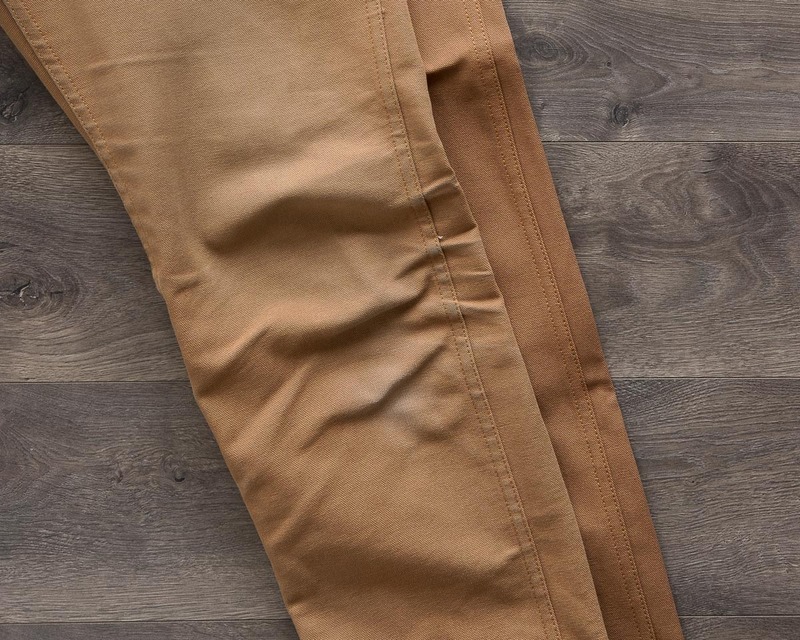 Make no mistake, this duck canvas trouser is our favorite non-denim pants – it’s easy to dress up or down, durable enough to beat around, and the perfect color for pairing with your favorite denim/blue shirts (which we all have). As with our previous highlight on the 3sixteen Indigo Nep Ranch Jacket, we want to highlight and showcase some of the garments we proudly carry to show how they wear over time, in a series we simply call Worn. Not only so you have a better idea of what to expect as you wear in your clothes, but also to have a larger space for us to go into what makes each piece unique and interesting. 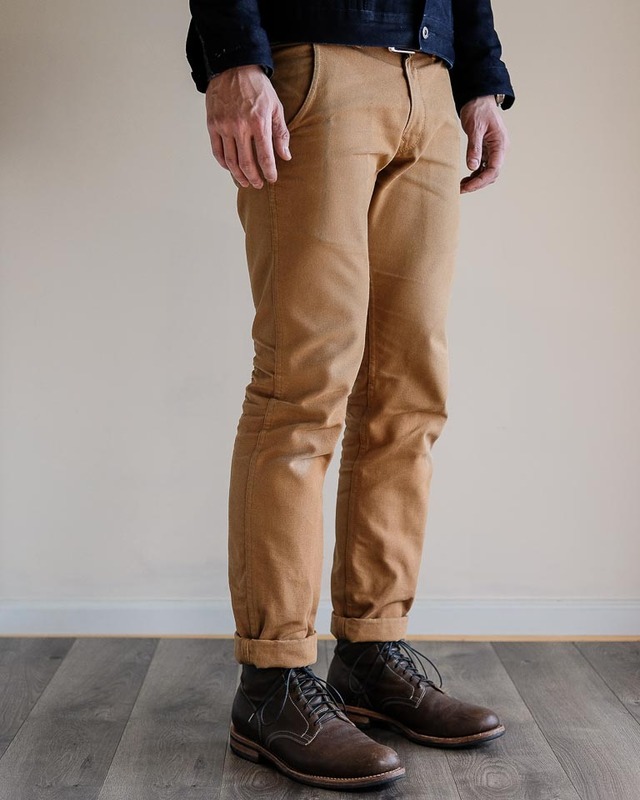 The Camel (Duck Canvas) Flight Trouser has gained quite a following in the Instagram denim community. 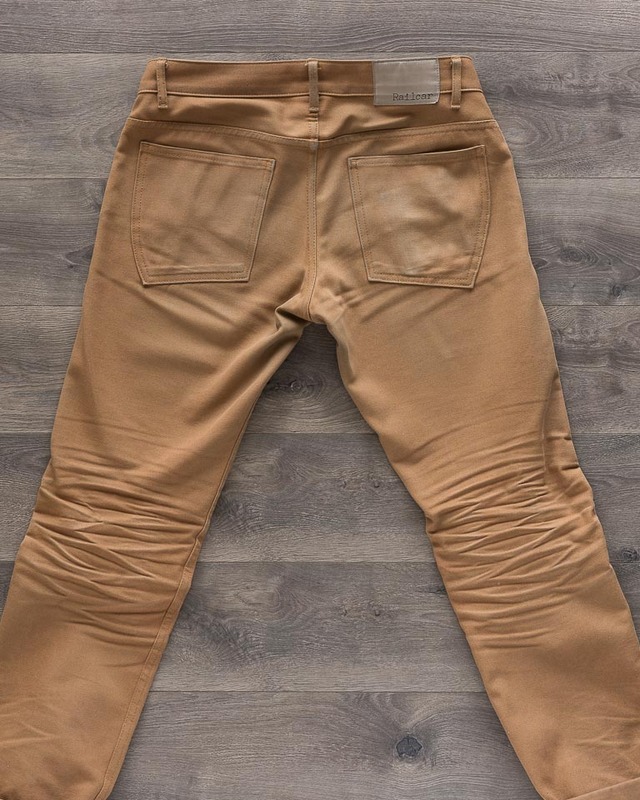 Although it’s obviously not denim, it does hail from the small operation of Steven’s Railcar Fine Goods in Monrovia, CA, where he makes these Flight Trousers, but also their extensive denim line-up. 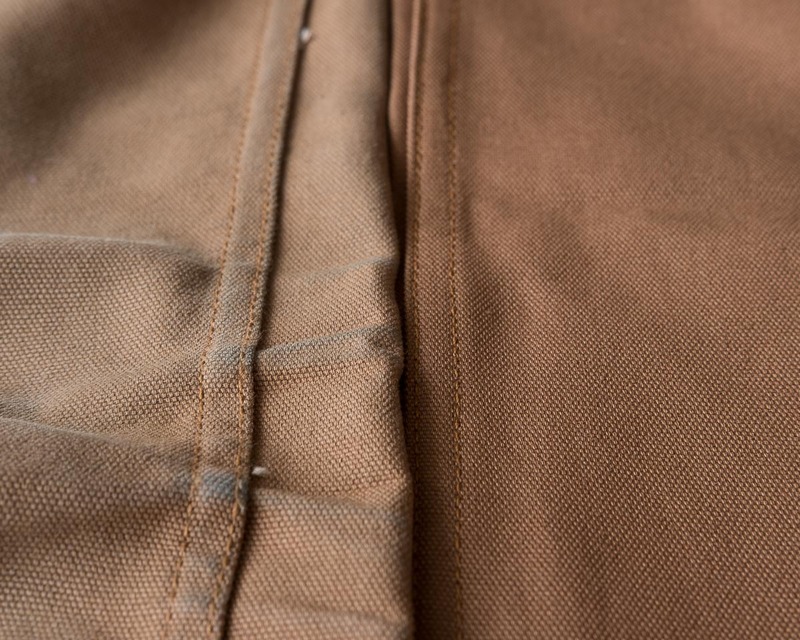 Steven’s inspiration for the Flight Trousers came from his father who was a fighter pilot. The image of the A-1 Skyraider Jet on the back tag of the Flight Trousers gives a nod to the aircraft that his father flew. 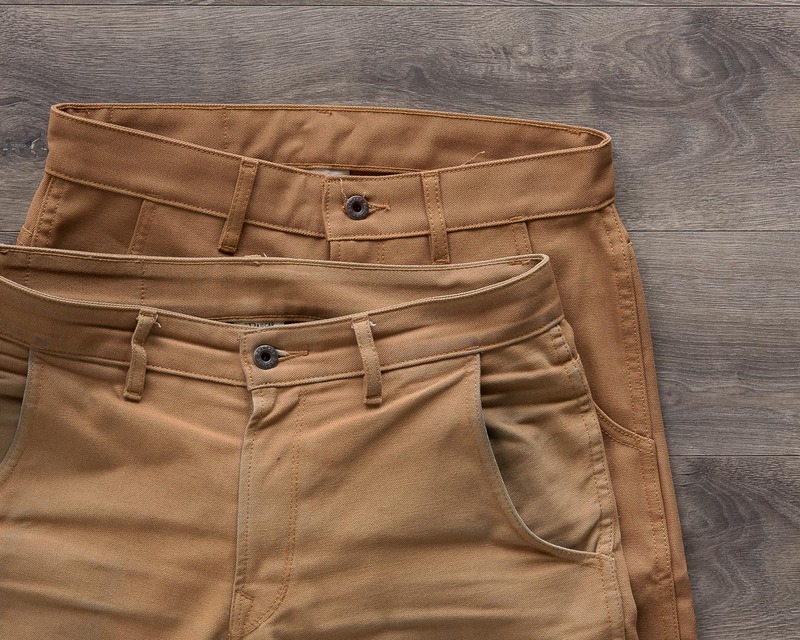 Much like the rest of their line-up, the Flight Trousers are vintage-inspired but with a modernized fit and finish. This is a pair that can be worn year-round. 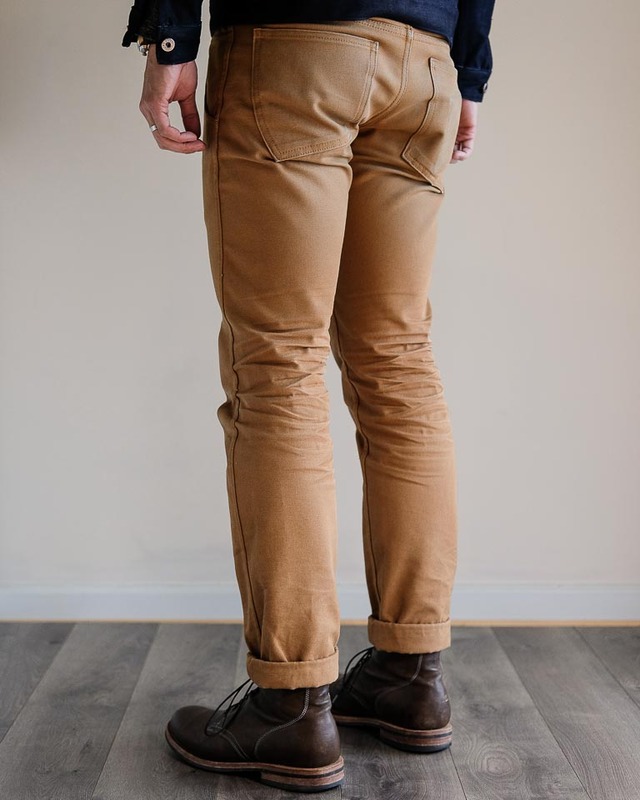 They work well in the summer months when you might want a break from some of your heavier denim, and they stand-up quite formidably in the winter months where the duck canvas’ dense weave helps stand against the wind and cold air. 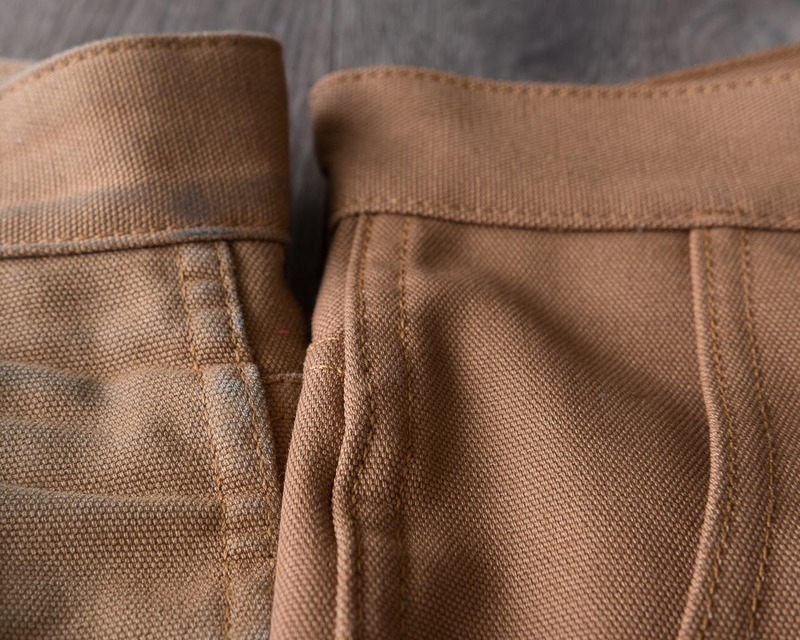 As part of this update on the Flight Trousers, we also provide general thoughts on styling and fit, in addition to how the fabric has fared over the last 16 months. This is one of the easier garments that we carry to pair with other clothes. Unless you’re looking to pull off an all-duck-canvas suit, then it’ll be pretty hard to go wrong with whatever you put together. 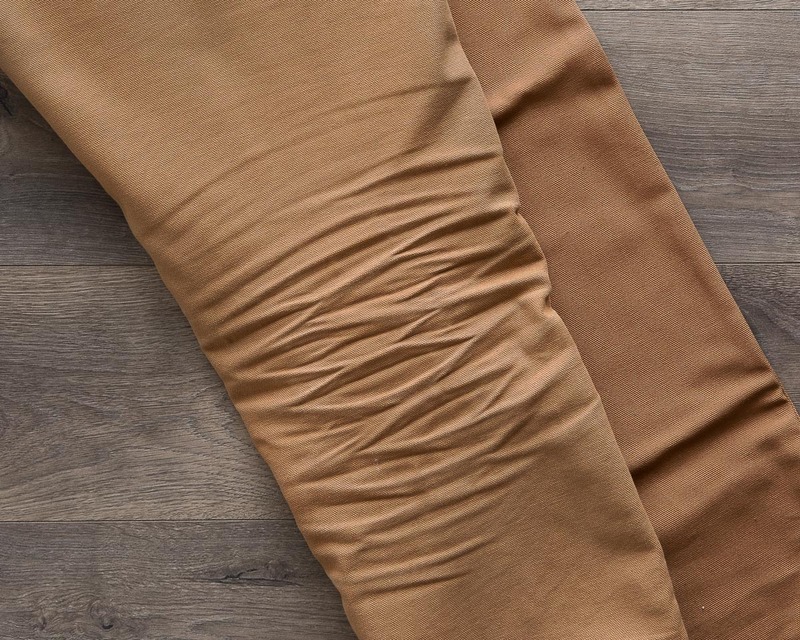 The color of the Camel Flight Trousers is close to a khaki color, but really much more bold and deeper than what you typically see in khaki. 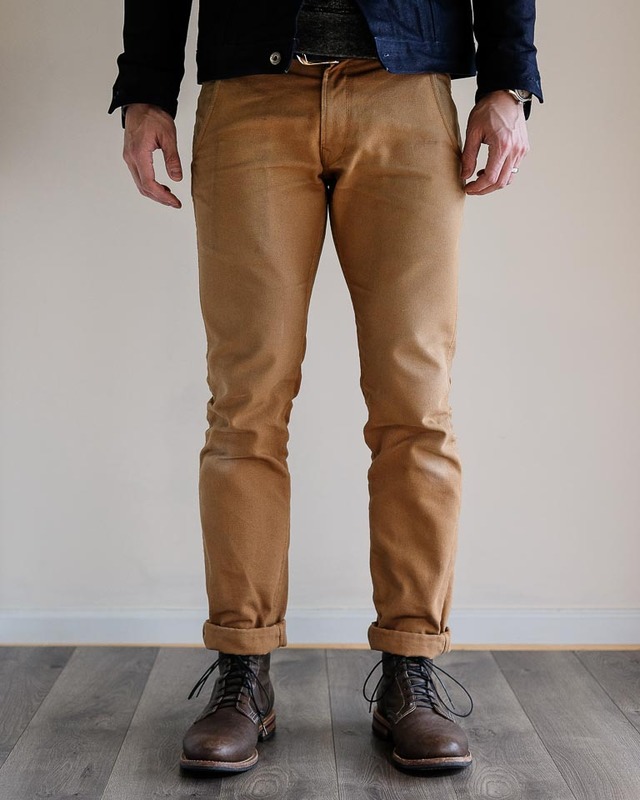 With that said, I find that any denim top – whether it’s a shirt or a jacket – goes extremely well with these pants. At first, I wasn’t quite sure why it worked so well and why I ended up always wearing the same denim or blue shirts on top, but after reminding myself of the color wheel, it all made sense. Certainly rules can be broken, but a safe bet when just starting out your styling is to stay within the rules. In this case, we’re simply talking about complementary colors; and if you look on the color wheel you’ll see that the blues are directly opposite of the oranges/yellows, where the Camel color lies. Looking back on my IG @doppki, I had to go back ten photos of the trousers before I found one where I didn’t have at least some shade of blue on top, and even then, it still looked good! Color science aside, these also go well when dressing up. Throw on a nice cashmere sweater or a blazer and you are set. The only downside for really putting this to good use in your business casual office setting is the slightly lower rise, which makes it a little harder to tuck your shirt in. However, I surmise that duck canvas in this color is probably too casual in any cut. I went against the general sizing recommendations and suggestions of most folks and sized down one from my regular denim size of 32. Railcar advises sizing up one from your normal Railcar size, however I wear size 31 in the Flight Trousers and size 32 in their Spikes fit. I also have gained some weight since I originally purchased this pair, so if I were in the market for one now, I would probably get the 32. 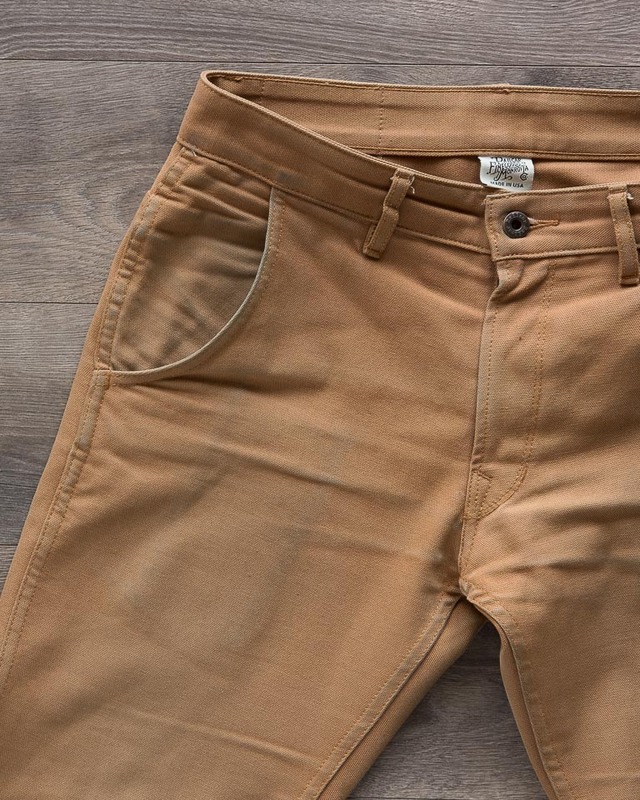 These trousers don’t stretch all that much, especially with the two-piece waistband. Nevertheless, my size 31 waist size is about 16.6-16.75”, from the original 16.25” size. On the thighs, my size 31 has stretched to 12.5” from 12.25”. and For reference, I am 6’0’’ and 175 lbs. If I lost 5 lbs and gave up 15-30 lbs on my squats, I’d opt for the 32 today in a brand new pair. On the type of fit, I would call it a slim tapered fit. 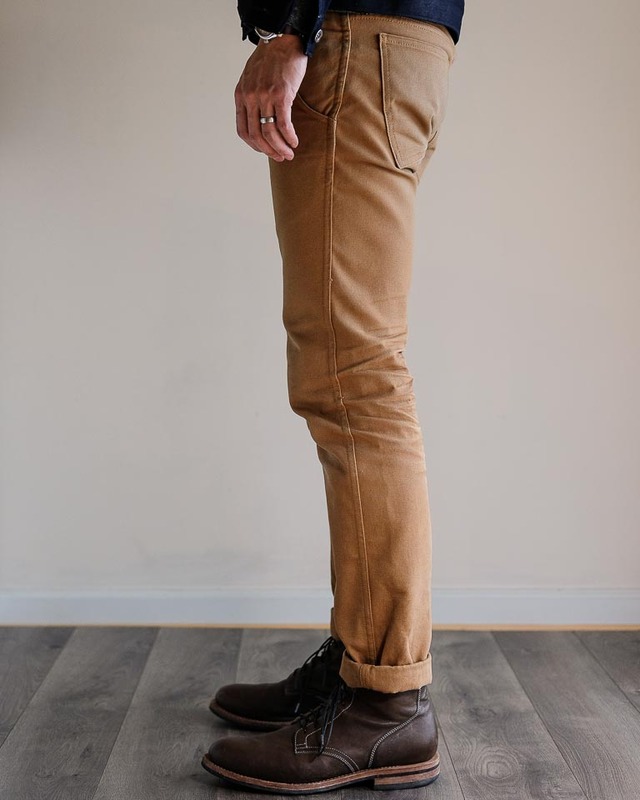 It’s fairly slim through the thighs, as it definitely doesn’t have the roomy top block of say a 3sixteen CT cut, with its higher rise and larger thighs. Nonetheless, the trousers still fit quite comfortably and roomy. 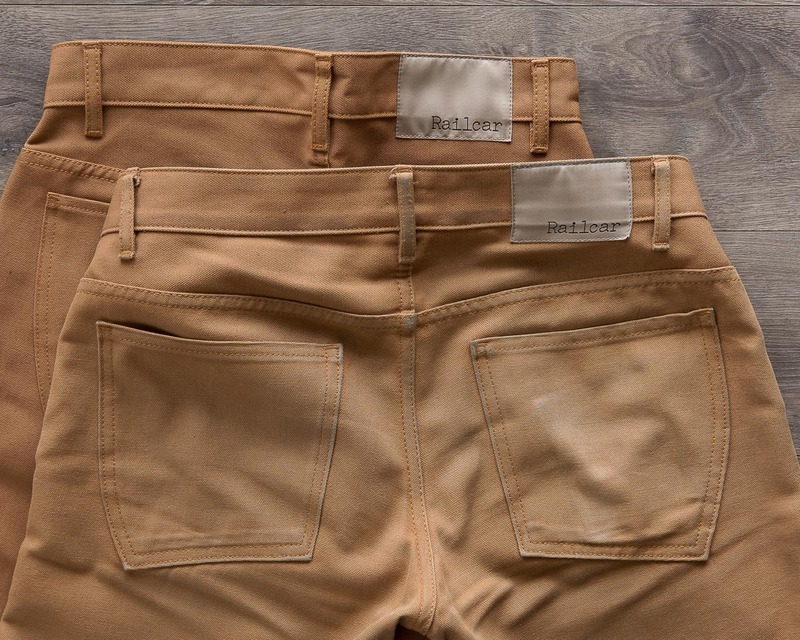 It may just be perception, given that it’s not as rigid as denim can be. 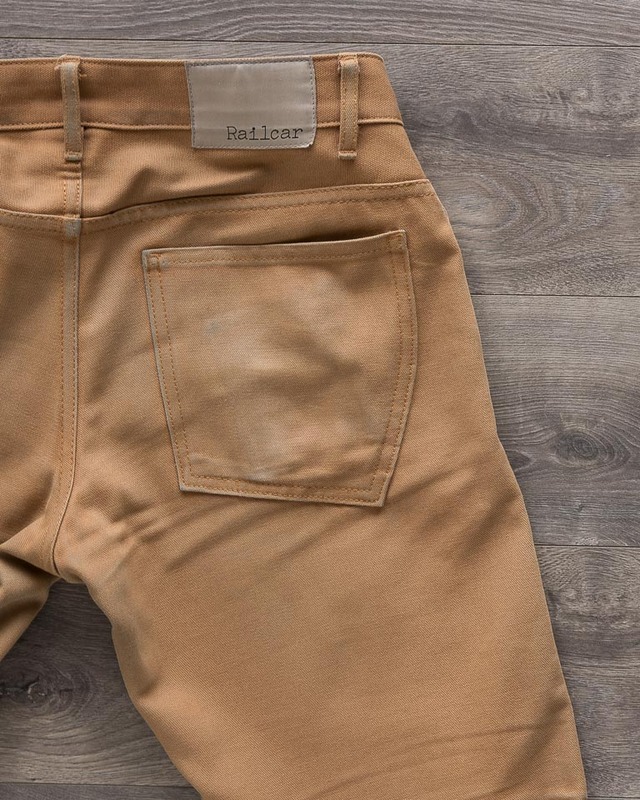 I’ll be the first to admit that my trousers have yet to see any wash or detergent in the 16 months that I’ve owned and worn them. Fortunately for those around me, they actually do not stink; they certainly don’t smell fresh or awesome, but they don’t have a stench. Part of the reason why I haven’t washed them yet is due to the likely shrinkage the trousers will experience upon wash. Right now, they are quite snug in the thighs and waist, so I’m afraid that washing them will move them from just about right, to just too tight. Here’s a couple of some recent photos from my IG feed here and here. 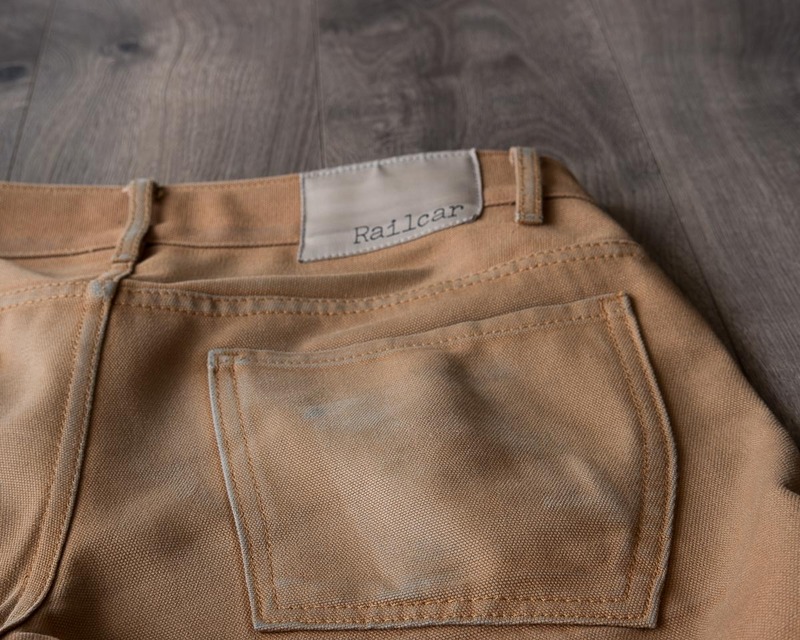 One last thing I’ll mention that I do like about Railcar is that their inseam lengths are usually set around 33”-34.5”; in this case, the flight trousers average around 33.5” for the inseam across the sizes we carry. That just means I don’t have to get them hemmed and can readily wear them off the shelf. 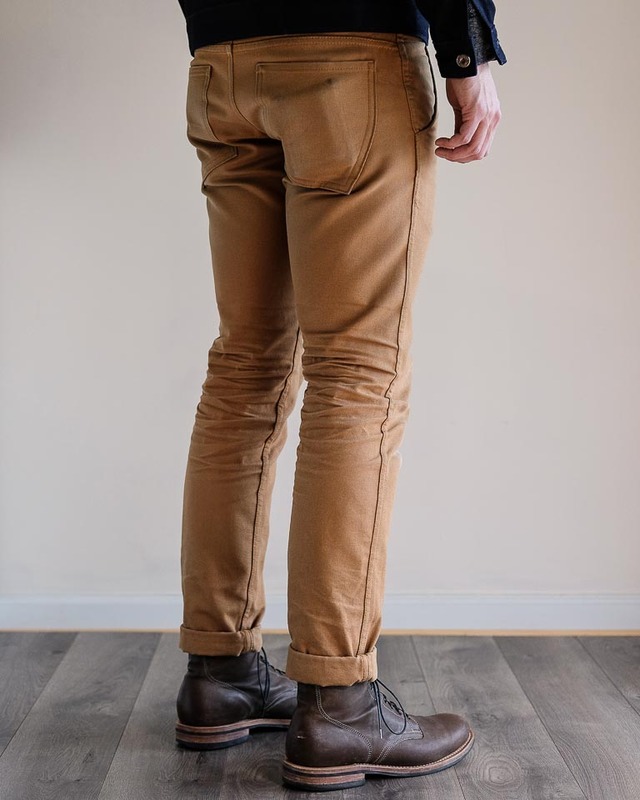 At the same time, unfortunately for those who are taller than maybe 6’2’’, you may have to deal with a slightly shorter inseam. The fabric definitely softens up over time. However, when you pick up a fresh pair of these trousers, they almost feel a bit too much like fabric, and not enough like a pair of pants. Let me explain since that might sound a little weird. But, when I pick up a brand new pair of these trousers, I feel like I’m about to do some arts and crafts. They just feel like fabric that I’m not used to, and maybe that’s because I’m just so used to denim fabrics instead of duck canvas. Interesting experience in any case, and possibly just me being bit too narrow-minded on my part. 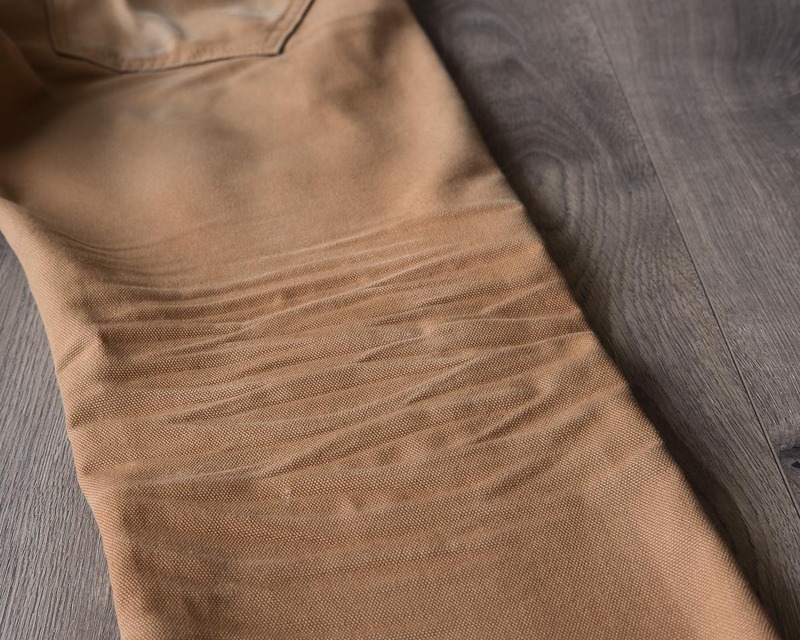 Over time, the fabric will begin to crease in all the right places and drape much more nicely down your legs. Right out of the box, they are comfortable – don’t get me wrong. 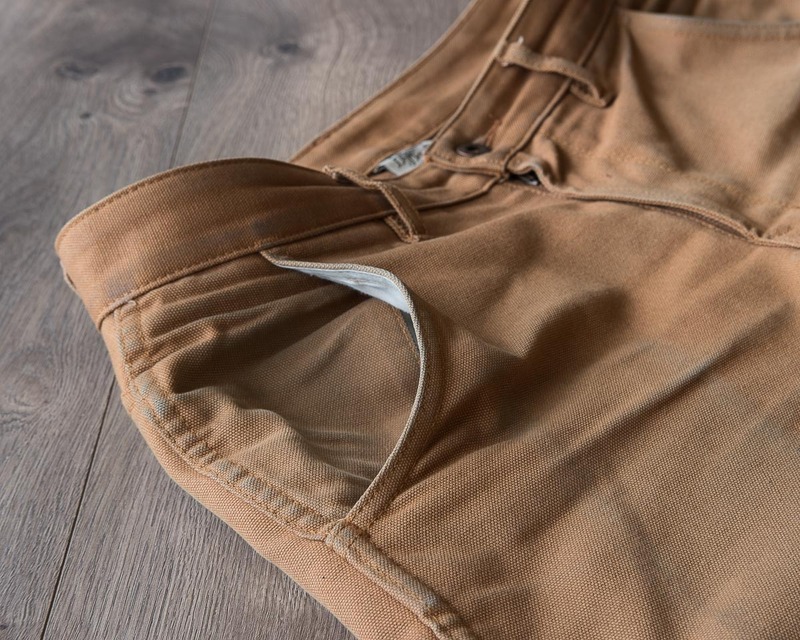 However, there’s always that short break-in period before your pants begin to just fall and drape perfectly. Having owned this piece for about 16 months, I can say that the shade of the Camel color has lightened substantially. 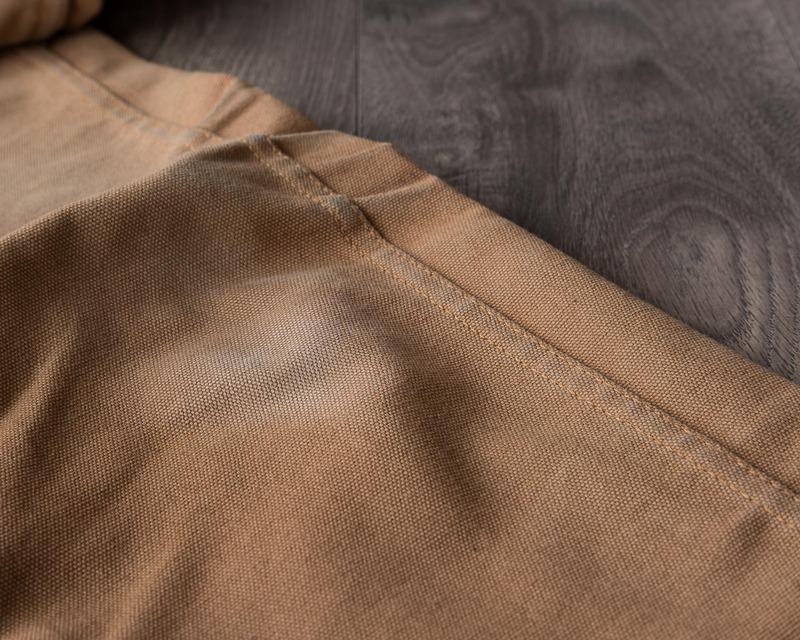 We readily think of indigo denim as having fades, but these duck canvas Flight Trousers also fade really well. You might not get super high-contrast electric blues, but as you see in the photos, they generally lighten up over time and the friction areas will whiten. Of course wearing denim tops, you’ll also see indigo coming off other articles of clothing and rubbing onto the trousers. I actually like how the trousers look now in it’s lightened state, much more than when I first wore it. 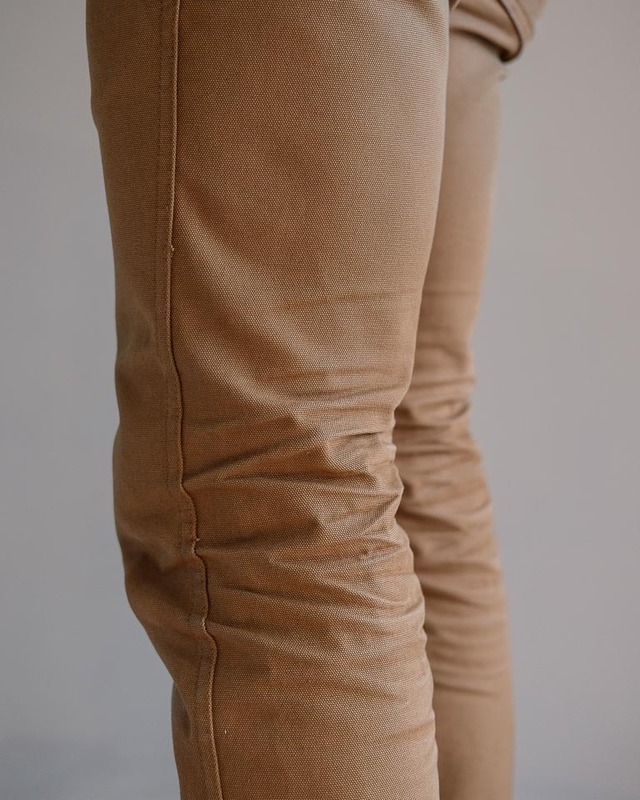 I think the deep Camel color at first is a bit too bold and high contrast in the ways I wear it. 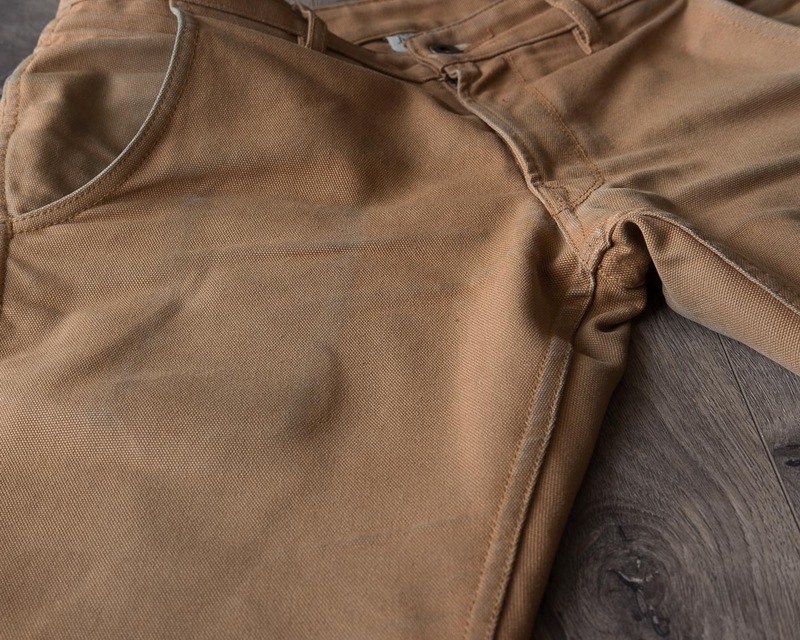 Given that I tend to wear deep colors on top (like navy colored shirts or denim jackets), having a lighter color of Camel tends to work better for me. 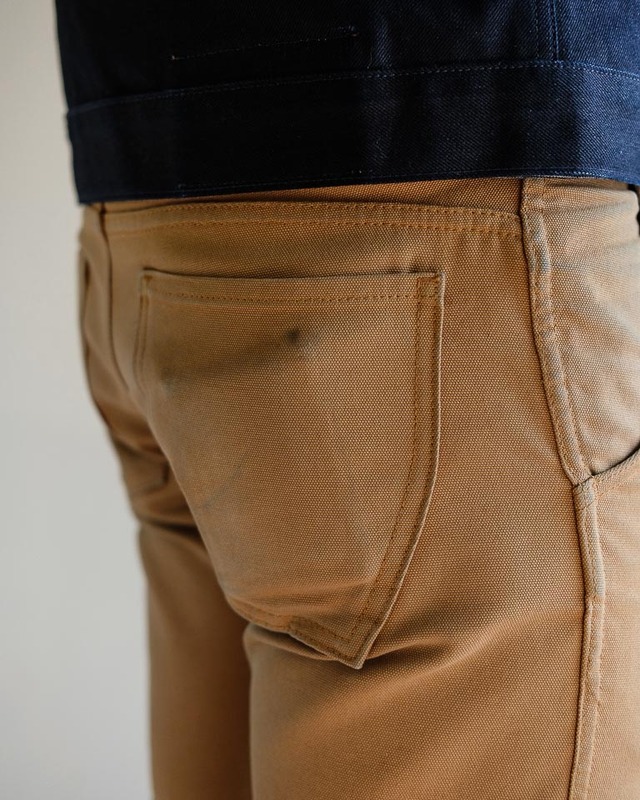 Due to the heavy-duty nature of duck canvas, even after 16 months of no wash and a lot of wear, there are no signs of any crotch blowouts or any other areas that might start ripping. 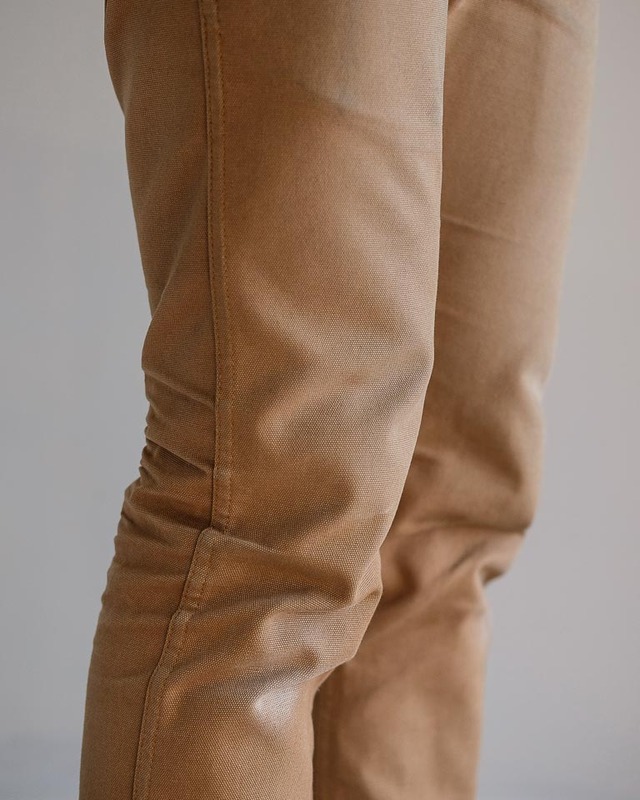 The part that has gotten the most abrasion is probably the knees, as I’ve tended to wear these when I’m working on things (like fixing up the car); at the knees they feel very soft and not coarse like the rest of the pants. So there’s definitely some fibers that have come off at that area. I’m very interested in giving it a wash, so the next update I give will probably be a post-wash update to include how much it shrinks and how the wash affected the color of the pants. At that time, I’ll also update this post with some info on washing and shrinkage. Feel free to message us on Instagram or email us at any time for questions on sizing. 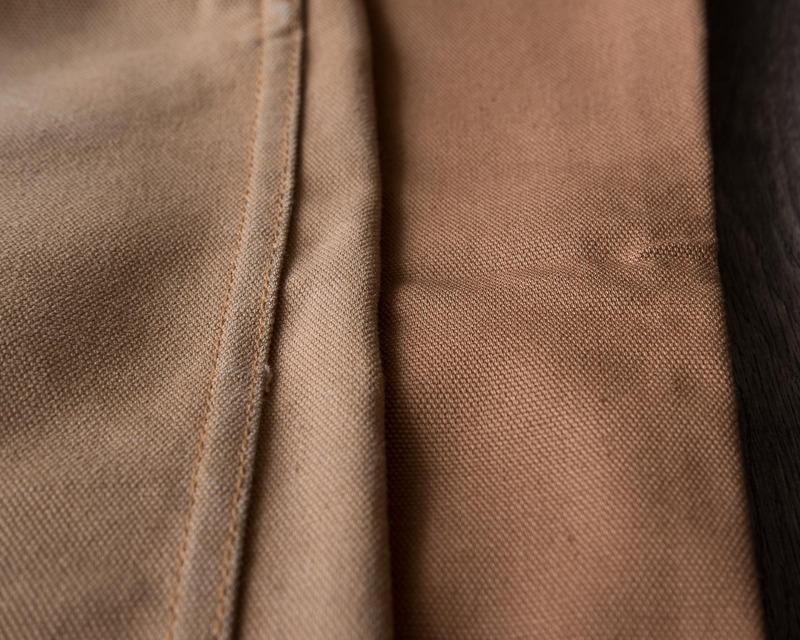 The Railcar Fine Goods Camel Flight Trouser is available at our store here. If you don’t see your size in stock, e-mail us for an estimate on when we may be able to restock your size.